Almost from the begining greeting card companies, along with florists and chocolaters began to exploit spreading Mothers' Day and founder Anna Marie Jarvis fought back. 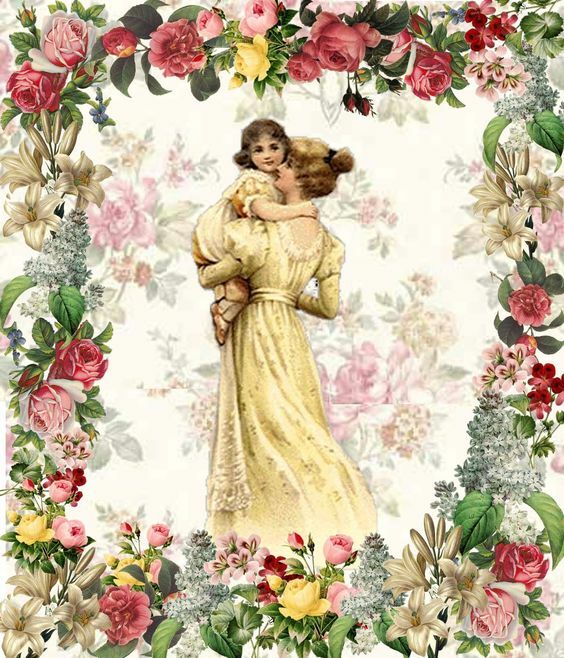 The celebration of Mother’s Day as we know it now is generally credited to Anna Marie Jarvis in memory of her mother, who died on May 9, 1905. The first commemorative service was held at the Methodist Church in Grafton, West Virginia where Jarvis’s mother had been a Sunday school teacher 111 years ago on May 12, 1907. The following year on May 10 the church, at Jarvis’s urging, expanded the service to include honoring all mothers and Jarvis’s friend, Philadelphia merchant prince John Wanamaker conducted a public observance in the auditorium of this store. Anna Jarvis founded Mothers' Day in remembereance of her own mother, left. Jarvis tirelessly dedicated herself to spreading the observance. She wrote articles and pamphlets, lobbied city councils, state legislatures, and Congress for proclamations establishing an official observance. West Virginia was the first to act, in 1910, followed by several other states over the next years. 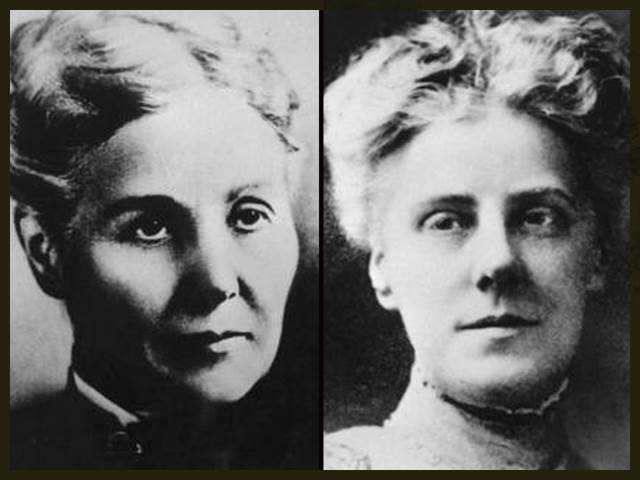 Jarvis’s efforts paid off when Congress on May 8, 1914 established the second Sunday in May as Mother’s Day and requesting the President issue a proclamation. Woodrow Wilson wasted no time, issuing his proclamation the next day, May 9, the official birthday of the Federal observance. Wilson’s proclamation directed Americans to show the flag in honor of mothers who had lost sons in war. That part of the declaration is an indication that Wilson was probably aware of the earlier efforts of Julia Ward Howe to establish a Mother’s Day observance to protest war. 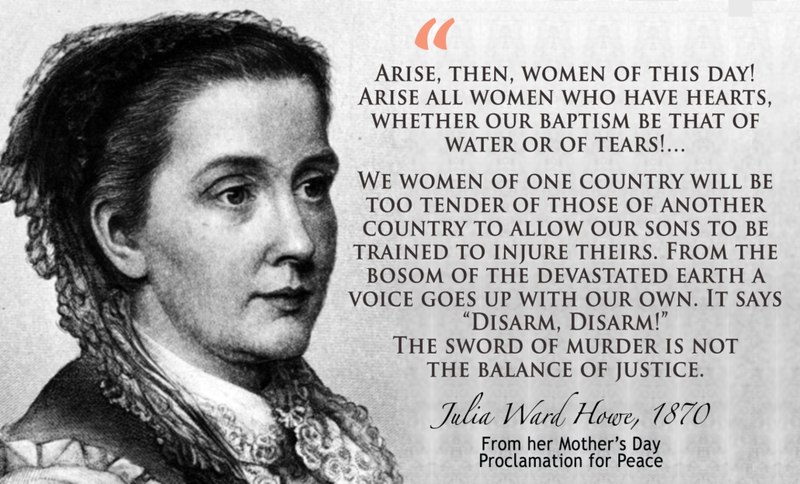 Julia Ward Howe call for an international Mothers' Day strike for peace did not get off the ground in 1870 but has been resurected and i now knowichhonored by the ontemporary peace movement, feminists, and Howe's denomination which is now knows as the Unitarian Universalist Association (UUA). Ward’s moving Mother’s Day Proclamation was written in 1870 in reaction to the carnage of the Civil War and the Franco-Prussian War and called for women across the globe to unite to end war. Although that noble effort never produced either the movement or the observation that Howe had hoped for, the effort was well known. When Howe died only four years earlier full of honors as the writer of the Battle Hymn of the Republic and one of the most famous American woman of letters, her obituaries revived interest in her effort, particularly among pacifists. In recent years the memory Howe’s Proclamation has been revived by the peace and feminist movements and by her Unitarian Universalist faith community and has been re-connected to Jarvis’s celebration. By the mid-1920’s Jarvis and her sister became embittered at the commercialization of the holiday they worked so hard to create. The sisters spent the rest of their lives and all of their inheritance battling that trend. They trademarked the names Mother’s Day and Second Sunday in May to try to keep merchants from using them. But there we too many fires to put out and not enough lawyers in the world to stamp out flagrant infringement. At least once she was arrested for protesting. Merchants, and especially the greeting card manufacturers that Jarvis particularly loathed, actually organized and launched a counter attack portraying her as demented and obsessed. They even questioned her patriotism. Since newspapers profited handsomely from Mother’s Day advertising, they were more than happy to abet the smear campaign. Jarvis and her sister spent their last dime in the fight and were reduced to abject poverty. Anna never married or had children of her own. Mother’s Day was her child and she fought fiercely to the end to defend its honor. She died in West Chester, Pennsylvania in 1948 at the age of 84 in obscurity. Ironically, many of the same merchants and business interests that had once vilified her later found it useful to enshrine her in legend, taking great care that her distaste for what the observance had become was carefully omitted from their new version of the founding myth—along with any mention of Julia Ward Howe’s earlier effort.